Letterpress printing on 100% cotton paper definitely makes an impression. Vintage swirls highlight your names on this fluorescent white wedding invitation. Big monogram = big impression on this letterpress wedding invitation. Choose your ink and foil colors to add style to the 100% cotton, fluorescent white paper. A unique typography design, letterpress printing and 100% cotton, fluorescent paper - it all lines up for a perfect wedding invitation. Luxury defined! Thick 100% cotton paper, foil stamping and your monogram make this wedding invitation a statement of your exquisite style. This invitation is unique yet classic with its square card and foil accents and border. It will have you feeling like royalty for your big day! Inside real wood covers is a folded little book - and it's your wedding invitation! Add photos, your wording and typography designs to show your style. Inside real wood covers is a folded little book - and it's your wedding invitation! Add your wording and typography designs to show your style. Send a regal invitation to guests announcing when your vows to each other will be with a letterpress invitation. The foil design around the names is breathtaking! 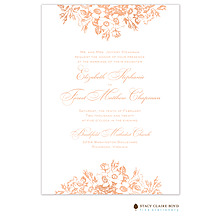 You deserve an invitation noteworthy of the elegant wedding you are planning. This gorgeous letterpress invitation will do all the talking for you! 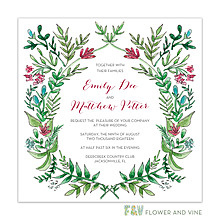 Elegant flourish and rose designs borders your wedding information on this beautiful invitation. Letterpress is an elegant way to invite guests to your wedding. 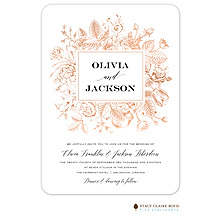 Leave a lasting impression of romance on your guests with this letterpress invitation. Along with your initials and flower design, romance surrounds your wedding day! The shimmering, pearl deckled edge adds flair to this white invitation. The simple detail is stunning and will be admired by all your friends and family!